Tantalum capacitors are electrolytic capacitors which use tantalum metal for the anode. 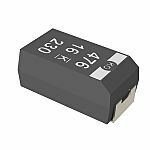 Tantalum capacitors are widely used in electronics design. They are polarized capacitors with superior frequency and stability characteristics. They are made of tantalum metal which acts as an anode, covered by a layer of oxide which acts as the dielectric, surrounded by a conductive cathode. The use of tantalum allows for a very thin dielectric layer. This results in a higher capacitance value per volume. Tantalum capacitors are made with capacitance values ranging from 1nF all the way to 72mF and they are much smaller in size than aluminum electrolytic capacitors of the same capacitance. These capacitors come in a variety of case sizes.